More than 50 major organisations have now signed up to the Tech She Can Charter, and the Royal Air Force Charitable Trust is the latest to get on board. Tech She Can is a commitment to take action together to increase the number of females taking up technology roles in the UK. It aims to tackle the root cause of the problem at a societal level by inspiring and educating young girls and women to get into tech careers and sharing best practice across the organisations involved. The charter was launched in February, with the initial backing of 19 organisations, to tackle the reasons behind the shortfall of women in technology roles. Only 19% of the UK technology workforce is currently female and they are endeavouring to change this. Their motto 'Together we can change the ratio' aims to inspire women to get involved with tech careers. They pledge to "work together to generate a lasting increase in the number of females pursuing technology careers" and to "share best practice from our own organisations." Sheridan Ash, women in tech leader at PwC and Tech She Can founder announced the Trust's support at the Royal International Air Tattoo 2018 in Fairford, Gloucestershire on Friday July 13. In her speech she said, "I was reading that the aim of the 100th birthday of the RAF is to commemorate, celebrate and inspire. I just wanted to say how much the RAF inspires me, particularly its approach to gender diversity. "There are so many fabulous women in this room who are all part of the RAF family... 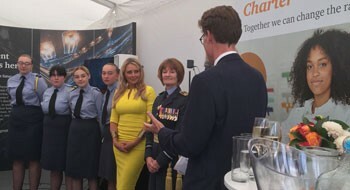 There are some that I want to mention in particular because they are really supporting Tech She Can, they are really supporting the RAF and they are all personally inspiring people..."
"I am thankful to the honorary group captain and ambassador for the group cadets, Carol Vorderman, who has been incredibly kind to support Tech She Can. We are also lucky to have Air Vice Marshal Sue Gray, the most senior ranking engineer in the RAF on board." Carol Vorderman also made a speech at the event. She said, "To make a difference, the change needs to start in schools and in the media. I'm supporting Tech She Can as it's only if organisations join forces that we can make a real difference and reach more young females to show them how technology and maths can have a positive impact on both their worlds and the wider world too."